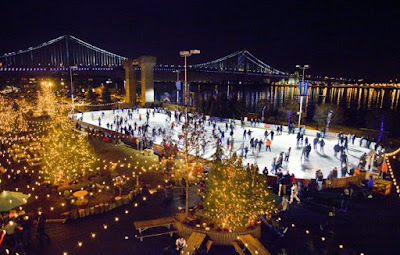 Ice skating, cocoa sipping and lodge lounging are among the cozy pastimes at the Delaware River Waterfront's seasonal wonderland Blue Cross RiverRink Winterfest (above). The Visit Philly Overnight Hotel Winter Package includes tickets for two rink admissions and two skate rentals. PHILADELPHIA, November 28, 2017 - The popular Visit Philly Overnight Hotel Package returns for the winter with dining discounts and museum admission, plus its ever-popular and convenient free hotel parking. Bookable now at visitphilly.com/overnight, the winter edition runs from December 1 through March 4, 2018. Free parking: Forty-three participating hotels offer free parking for one car for up to two nights-that's up to $100 in value at Center City hotels. Long Weekends: Martin Luther King Jr. weekend (January 12-15, 2018) and Presidents' Day weekend (February 16-19, 2018) give visitors three full days to explore. Those celebrating the life of King and U.S. presidents can enjoy visits to historic sites and museums, such as the Liberty Bell Center, Independence Hall, The President's House, The African American Museum in Philadelphia and National Constitution Center, among others. Special Events: Winter Fountains for the Parkway (December 1-March 18, 2018), the centerpiece exhibition of Parkway 100 - the city's 14-month celebration of the Parkway Museums District illuminates the area with a stunning nighttime display of video projections on four large domes. Thousands of decorative strutters kick off the New Year by marching along Broad Street for the Mummers Parade (January 1, 2018). The Philadelphia Auto Show (January 27-February 4, 2018) showcases the automotive industry's latest creations with more than 700 concept, classic, luxury and exotic cars on display at the Pennsylvania Convention Center. Also at the Convention Center, the Philadelphia Flower Show (March 3-11, 2018) presents Wonders of Water, featuring top-of-the-line horticulture and landscape design, entertainment and more than 100 vendors. The Philly Craft Beer Festival (March 3, 2018) brings national and international breweries and food trucks to the Philadelphia Navy Yard. Special Exhibits: Families can check out Daniel Tiger's Neighborhood: A Grr-ific Exhibit, where the award-winning PBS Kids television series comes to life at the Please Touch Museum and Tiny Titans: Dinosaur Eggs and Babies at the Academy of NaturalSciences of Drexel University, featuring rare, real dino eggs and nests from around the world (both through January 15, 2018). Two more exhibitions that are worth a visit: Kiefer Rodin, a combination of the works of Auguste Rodin and contemporary artist Anselm Kieferat at the Barnes Foundation (through March 12, 2018); and Chuck Close Photographs, a display of 90 of the photographer's images from 1964 to present at the Pennsylvania Academy of the Fine Arts (through April 8, 2018). VISIT PHILADELPHIA® is our name and our mission. As the region's official tourism marketing agency, we build Greater Philadelphia's image, drive visitation and boost the economy. On Greater Philadelphia's official visitor website and blog, visitphilly.com and uwishunu.com, visitors can explore things to do, upcoming events, themed itineraries and hotel packages. Compelling photography and videos, interactive maps and detailed visitor information make the sites effective trip-planning tools. Along with Visit Philly social media channels, the online platforms communicate directly with consumers. Travelers can also call and stop into the Independence Visitor Center for additional information and tickets.